Our honda has really held together. It's got some aesthetic problems being a legal adult now, the paint is chipped and it has scrapes and dents, but it not only got us through the 6 years we lived in another state driving back and forth between neighboring states (3 hour drive), but taught 2 teenagers how to drive. The a/c continues to go out on it, and it needs a new coolant put in every other year, and the deductible rate right now is only $50... so if we get into a crash it won't be saved anymore... but it's a really nice vehicle and I will drive it into the ground, which I suspect will be another decade before that happens... at which time we will be getting another Honda. To be honest, I am not a picky driver. My car has lasted my family 18 years and gets me where I need to go. To me, that's what matters most. I like that it has survived this long. It also has ample space for my large family and has last many long road trips. The air conditioning failed on my once two years ago but it was easily remedied and did not affect the car's overall performance. The Honda van: truly a family friendly car. I enjoy the amount of room offered in the Honda van. For a large family there is enough room for passengers and cargo. It is easy to drive and I have not had many problems with it. Gas mileage is decent. I have an older model, so it does not have any fancy features. 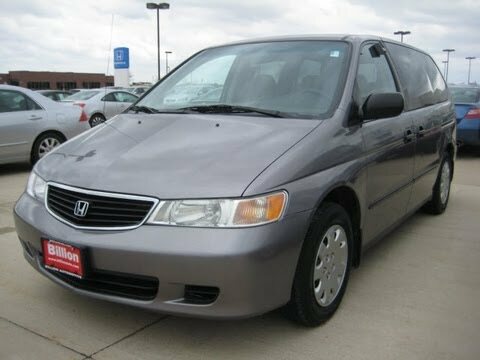 But, we bought the Honda van strictly because we had a growing family and needed a car to accommodate us all. On certain mini vans, the dimmer control for the instrument panel lights can fail. At night, the driver would not be able to see the instrument panel gauges and displays, and may not be aware of the speed or problems with the vehicle, increasing the risk of a crash. Dealers will replace the multiplex unit. The manufacturer has reported that owner notification will begin during September 2000. Owners who do not receive the free remedy within a reasonable time should contact Honda at 1-800-999-1009. On certain minivans, the sliding doors may not latch properly because the latches were not correctly riveted during manufacture. Dealers will replace the door latch assembly on all Odyssey minivans built from Dec. 10, 1999 through Jan. 7, 2000. Also included in this recall are approximately 1,400 Odyssey minivans that had the latches replaced under recall 99V-158 or under warranty, that may need to have the latches replaced again. Owners of these vehicles will be notified by Honda to bring the vehicle to their Honda dealer for inspection of the previously replaced latch assembly. Latches with the suspect date code will be replaced. The manufacturer has reported that owner notification will begin June 22, 2000. Owners who do not receive the free remedy within a reasonable time should contact Honda at 1-800-999-1009. On certain minivans, a wire harness, located within the engine compartment, could be damaged by contact with a metal pipe, possibly resulting in a blown fuse. If a fuse blows, engine power, or operation of any or all electrical components, can be lost, including lights, windshield wipers, horn, and the anti-lock function of the brakes. A sudden loss of power or lighting, or a failure of the windshield wipers or anti-lock brake feature in bad weather, increases the risk of a crash. Dealers will install a protective covering over the wire harness and metal pipe to prevent this problem. If any wires are damaged, the dealer will make the necessary repairs, and then install the protective covering. The manufacturer has reported that owner notification was to begin during March 2000. Owners who do not receive the free remedy within a reasonable time should contact Honda at 1-800-999-1009.